On September 14, Western Christian churches celebrate the Exaltation of the Holy Cross, often referred to as the Feast of the Cross. It commemorates the dedication of the Church of the Holy Sepulchre in 355. The Feast of the Cross is closely related to the discovery of the True Cross. The term “the True Cross” refers to the remnants of the cross upon which Jesus Christ was crucified. According to Christian tradition, they were discovered by Saint Helena, the mother of the first Christian Roman Emperor Constantine the Great, in 326. 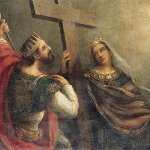 That year, Saint Helena made a pilgrimage to Jerusalem and rediscovered the True Cross. Helena and Constantine ordered to build a church at the site of the discovery. The Church of the Holy Sepulchre was completed in 335. Its dedication took place on September 13 that same year. The next day, the True Cross was taken outside so that the clergy and faithful could venerate it. September 14 was designated as the Feast of the Exaltation of the Holy Cross. Many Western churches stipulate red as the liturgical color for the day. For example, Roman Catholic priests are required to wear red vestments at church services conducted on September 14. This feast is one of the several holidays dedicated to the Holy Cross.